In this article you can find guidelines and best practices about making sure your subscribers love what you send them. 1.Make sure that the Messenger subscription is as apparent as possible. This is especially important if you’re using a pre-checked Add to Cart Widget to collect Messenger subscribers. Since it automatically opts in your visitors, you need to make sure that it’s clearly visible and right under the Add to Cart Button, along with an informative text about the fact that they are going to sign up to your Messenger campaigns. You can learn more about this by reading our Add to Cart Widget Compliancy Checklist. 2. Make sure the timing of your messages is compliant with Facebook’s policies. The rule for sending promotional content via Messenger is that you’re only allowed to do so in the first 24 hours after a visitor subscribed or messaged your Facebook page, plus once after that as a follow-up. Please keep this in mind when you edit the timing of your Automated Messenger campaigns. We recommend sending the first message after an hour, the second in 23 hours, and the third one after 48 hours. You also need to pay attention to this when sending Instant Messenger Campaigns. In our Instant Messenger Campaign editor, you can choose to send each campaign as ‘News’ or ’Promotional', with an option to send Smart Promotion Campaigns which are the best way to reach as many subscribers as possible, and send promotional content in a way that's 100% compliant with all Facebook policies. 2. Inform your subscribers about the fact that they subscribed. People expect to receive a welcome message with the channel after signing up. To make sure the first promotional campaign doesn’t hit them as a surprise, we highly recommend using the Messenger Welcome campaigns. It will be sent to people right after they subscribed, informing them that they did, and giving them an easy way to opt out if they wish with a quick reply button. They can also send ‘Unsubscribe’ if they want to stop receiving messages from your page later on. Since different audiences might react differently to Messenger campaigns, you should always keep track of your stats even if all your settings are compliant with Facebook’s policies. 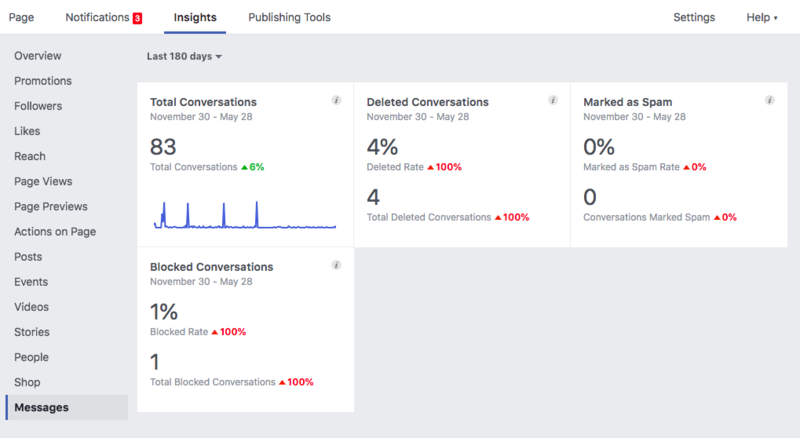 You can check your statistics in your Facebook Page Insights under the Messages section. Facebook doesn’t have any clear documentation about how they measure these stats, so just try to keep the Blocked and Marked as Spam rates as low as possible. In our experience, the Messenger Welcome campaigns are great for keeping the blocked rate low, since people usually only block the Facebook page if they can’t find an easy way to unsubscribe. If your Marked as Spam rate is high, you might want to consider disabling the third Messenger Abandoned Cart campaign, as three messages might be a bit too much for certain audiences. Since Messenger is a very personal platform, you should try to set up your campaigns so that they reflect your brand's voice, and that they give the impression of a friendly chat between your business and your customers.